The county mayor's office confirmed that one person has been injured in Hawaii's Kilauea volcano eruption. A man has been injured in Hawaii's Kilauea volcano eruption. It's the first reported injury since fissures started opening May 3. The county mayor's office confirmed that a homeowner in the eastern town of Pahoa was sitting on his balcony when a lava splatter hit his leg, shattering everything from his shin down. 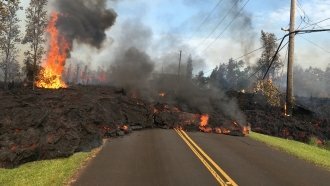 Lava continues to flow on the Big Island. The eastern part is dealing with new evacuations after active lava flows caused brush fires in the area. And as of 11 p.m. local time Saturday, Hawaii County Civil Defense said two flows were making their way across a main highway on the eastern part of the island. Authorities also said lava had entered the ocean. Officials warn hot lava hitting the ocean could cause laze, which shoots hydrochloric acid and steam with fine glass particles into the air. They've advised people to stay away from the area. As Newsy previously reported, 22 fissures have opened on the Big Island, and lava has covered hundreds of acres and claimed at least 44 structures.